First I am assuming that all you need to do is open an Access document from your C# application. 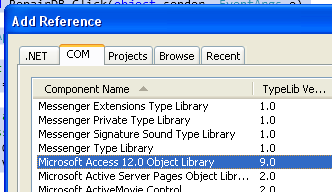 When you click a button or initiate a new event, you want to open an Access database in “Microsoft Access”. Microsoft provides the following article but it is not complete http://support.microsoft.com/kb/317114. 1. First of all make sure that the database really exists at the location you specified. Chaging it to false indicates non-exclusivity.